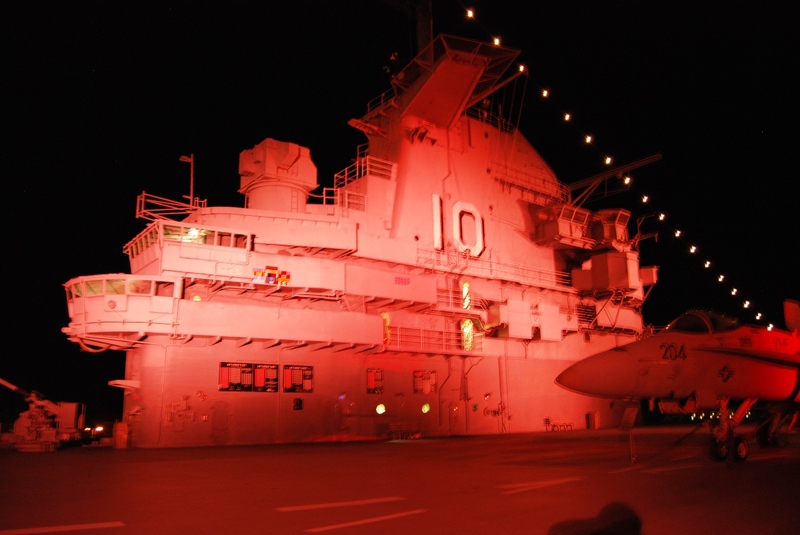 The USS Yorktown also went pink in October 2011. Photo courtesy of Patriots Point. For the second year in a row, the flight deck of the USS Yorktown will shine pink every night in October for Breast Cancer Awareness Month, Live 5 News in Mt. Pleasant, S.C. reported. The retired aircraft carrier-turned-museum, also known as the “Fighting Lady,” is docked at Patriots Point. It has been fitted with pink lights to illuminate the flight deck. “As a part of the greater Charleston family, Patriots Point is proud to support this important initiative, which shines light on a disease that 1 in 8 women and 1 in 1,000 men will develop over the course of their lifetime,” Mac Burdette, executive director of Patriots Point, told the news station. Military women are 20 to 40 percent more likely to develop breast cancer than other women in the same age group, according to a story in this week’s Navy Times.